THE GARMENT OF CHRISTIANITY DOES NOT COVER ALL THE PEOPLES WHO BY RIGHT OF CULTURE AND INDUSTRY FORM A PART OF CONTEMPORARY CIVILIZATION. HE Parsecs of Bombay, the Brahmins of Benares eagerly welcome our science, but the yare coldly polite to the Christian Missionaries. The Japanese, though so prompt in imitating us, take care not to accept our religion. As for the Chinese, they are much too cunning and wary to allow themselves to be converted. "We have no need of your priests,"says an English poem written by a Chinese, "We have too many ourselves, both long-haired and shaven. What we need is your arms and your science, to fight you and expel you from our land, as the wind drives forth the withered leaves!" THE CHRISTIAN RELIGION IS LIKE A SNOW-WREATH MELTING IN THE SUN: TRACES ARE VISIBLE HERE AND THERE, BUT BENEATH THE STREAKS OF DIRTY WHITE THE EARTH SHOWS, ALREADY CLEAR OF RIME. The religion which is thus becoming detached, like a garment, from European civilization, was extremely convenient for the explanation of misery, injustice, and social inequality. It had one solution for everything- miracles. A supreme will had pre-ordained all things. Injustice was an apparent evil, but it was preparing good things to come. MONGST the various people in different states of life whom the writer of these lines has met, none left an impression nearly as deep and everlasting as did Elie Reclus. There obviously existed a great affinity of mind (all proportions reserved) between the writer and the man he is ever proud to call his friend. Elsewhere in this book, the reader will find ample information about the man and his works. It was stated that this Compilation should consist of Monographies by those who knew the Brothers Reclus. Thus Elie will surely be spoken of from different points of view. However, perhaps one aspect, at which we will hint presently, is overlooked. There will be Elie Reclus and his life-long association with the works of his brother Elisée. 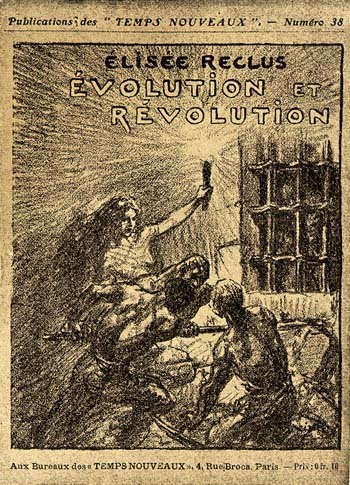 There will also be Elie Reclus and Ethnography, Folklore, Mythology; he will be described as a revolutionist, as a follower, from his youth, of advanced ideas, those ideas of the first half of the nineteenth century, some of which are now-a-days such matter-of-fact realities that our generation recollects with difficulty the faithful and tenacious labours of the almost forgotten pioneers. The writer runs less risk than many another of underestimating the fights waged two generarions before him, for he heard in his youth from his father how passionately struggles were going on in favor of railways, watersystems, saving-banks, cooperatives and friendly societies. At one of his first visits to Elie Reclus, he told about his father's association with Saint-Simonism, having made known in Holland the works of the socialist theorist Saint-Simon and his disciples "Father" Enfantin and Michel Chevalier, and having been, on this account, proclaimed "our arch-bishop of Holland", at an after-dinner speech by the somewhat pompous and popish Enfantin, about 1850, in the latter days of the Saint-Simonist "Religion" as it was called. Elie Reclus, born twenty years later than the writer's father, followed at that time the school of Fourier, a socialist doctrine adopted also by many former adepts of Saint-Simon; for as far as these did not enter into industry and become rich, Elie Reclus himself considered both schools as nearly identical, as regards the propagation of socialiscic ideas at the said period. Amongst the papers in which his writings were scattered was the Buenos Aires daily "La Nacion". 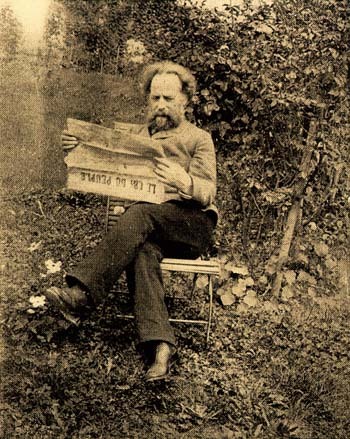 The writer had seen a copy of said newspaper containing the photograph of "Elisée Reclus; our European Correspondent". And it was indeed the photograph of Elie's brother! The writer himself once quoted Elie Reclus in a Dutch monthly. The editor "corrected" the name into "Elisée Reclus", and this name remained even after having been corrected on the proof. It needed an explanatory letter to obtain a correcling note in the next issue. These are petty facts, but they show clearly how far the influence of Elie's life rule extended. They also seem to point to a difference between the outward manifestations of the brothers. In no way was Elisée ever striving for what he accidently became. He is the only one of all the famous men of science of our time to whom no authorities ever were tempted to offer any ribbon. Others may have refused honours; his simplicity and righteousness were too well-known all over the world for any one anywhere to believe that they could "reward" him. But he wrote great works the subject of which: the physical conformation of our planet; the adaptation of the globe to human life, aroused universal interest. It was the nature of his science that made the man and his works popular. Elie on the other hand never arrived at achievement of the large works we may suppose he planned out. If he did not utilize the huge mass of documents he collected, it might be called a sequel to his formula: he shunned success. But there is more to be said in this respect. The science of Elie- Ethnology, Science of Religions, Mythology, Folklore (that new science springing up during his lifetime and of which he became one of the passionate pioneers)- was essentially unstable, always modifying, ever restless. More than in other fields of stucly, was the truth of today often the error of tomorrow. This anatomy of the human soul, this palaeontology of ideas and conceptions could not awake the interest of the multitudes and was not, like geography, interwoven with every day life. If Elie Reclus had published a great work on human conceptions, a work we vaguely see in a schematic shape when perusing his classified documents, such a work could only have found appreciation in cultivated minds, and the name of its author would hardly have passed the circles of specializing students. Elie Reclus felt more than anyone the ever shifting foundation of his field of study. And he felt it too much. This might have been another reason for his state of mind. He was possessed by the everlasting conviction that his work was not ripe, that he should penetrate deeper into the subject, that he should commence and re-comrnence his whole labour. The fragmentary studies on rites, magics, and kindred subjects, published in various periodicals, during the later years of his life, (mostly lectures he delivered at the Brussels "Universite Nouvelle"), were never purposed by their author for printing. They were in the full sense of the word extorted from him. The writer speaks with knowledge of the facts, for he obtained himself in this way a selected series on "Animisme et Demonisme" (Elie gave them this title), which were granted only because it was for printing in a foreign lan guage. In French, the author stated, he should not like to have them published before first "doing them over." At any rate, the work was so much finished that what was granted in 1899 for translation proved nearly identical with the posthumous volume edited in 1908 by the late Maurice Vernes, as first (and only) volume of a series on Popular Belief. In 1899 the author himself settled the order of the chapters; in 1908, the selection being worked on by Mr. Vernes, the order is not the same, but most chapters are to be found in both books. Elie Reclus used to explain his indifference to the publication of his writings by his almost exaggerated neurone-theory, by which he desired to establish that the results of his study and thinking would of necessity find their way into other brains ripe for such conceptions, without need of first printing them into books. It cannot be settled in how far this theory was seriously meant, in how far it was a mere excuse for extreme modesty. In any case, the fact remains that Elie disposed of his tremendous accumulation of documents true always to this rule. He settled, in his last days, that the documents on religion should be offered to the "College de France"; Lecturer Mr. Maurice Vernes, specifying that such was not with an object of posthumous publication, but merely to have the satisfaction that the labour of his life should be of some use to younger students in the same field. Here we come to an aspect of our friend that perhaps will not be considered by other contributors. One would not easily associate Elie Reclus with Botany. Still some of his finest writings deal with plants. It is now exactly 25 years ago,  that the writer had so many never to be-forgotten chats with Elie Reclus on Plantlore, where it must strike the young man as something very unusual to see this gray scientist, time and time again, while bestowing his bounty of wisdom upon his visitor act as though he were learning from the latter. He than vaguely and incidentally told that he himself wrote a few stories on flowers long ago, before 1870. He did not know where to find them at the moment, was not quite sure whether they were ever printed. Suddenly one day he pointed to his portfolio "Flora", the botanical part of his universal picture collection, and indicating from his hundreds of classified wrappers of notes, a dozen or so labelled "Flora", "Circe","Maja", evidently aware of the fact that his young visitor was deeply interested in the association of plants with human life, with popular belief and folk medicine, with symbols, legends and traditions, he offered all he had on the subject saying: "Take all this, if you care, and back it up by sound investigation. You will find something there, and you can always extend this information. Make use of it if you can. The field I selected is too extensive. A simple corner of it will yield plentiful labour for a well-spent life-time." This was no trifling present for the young man, who at that time was precisely ambitious of becoming a labourer in the very vine-yard here opened to him with such grace. Writing these lines, he is seated before this inheritance, and however little he was able to elaborate the plans of his youth, he still counts that moment 25 years ago as one of the best which life has ever offered him. It was amongst these notes that the Plant stories referred to above, purposed to bear the title "Physionomies Vegetales", were discovered some of them fiinished, some worked out schematically, consisting of separate notes that were as yet to be linked together. The bulk of them was written in a kind of personal shorthand, a phonetic alphabet Elie contrived for his own use, which did not make the reading a very simple matter. Still more was it a very delicate task to join the notes together and to constitute of them a whole, approaching more or less what might be supposed to have been the author's intention. In such a way, several essays were rising out of this material: On the Love-story of Oakland Honeysuckle; On the Fly-catching Sundew; the Speaking Murderer; On the Volubilis (with the sub-title "The world lasts but a moment); On the Rose, or the Secret of Beauty; On the Bittersweet, or the dualism of Joy and Sorrow; On the Dandelion. An "Introduction", obviously intended for this series. was found elsewhere among other papers, together with three short flower-stories, all this dated 1869. Altogether this could form a lovely little booklet, enriched by essays only on kindred subjects known to have been printed during the author's lifetime; "Why green garlands are used et Yuletide" and "The Mandragora or the Magic Origin of Medicine". The editors of the Scotch anthology where the first of these two papers was printed, were right to leave these beautiful pages in the original French. Their poetical style, their charming wording, could but have lost by any translation. Some of the above named, reconstructed plant-tales were since printed in a Belgian monthly. There exist some indications of the intention to work out other plant-characters: Rosemary and Stocks, Plane-tree, Ash and Beech, but there remains nothing more in the notes which could be reconstructed with any pretension that one could recognize Elie Reclus in the result of this work. As to those "Physionomies" found in a completer state, the compiler who linked them together will find consolation in the fact that the quite personal style of the author will easily be detected amidst the additions due to the hand which simply joined the materials. Of course, the writer of those charming flower-tales- shall they be called "fables" or do they belong to ethics or to symbolical philosophy of the noblest alloy ?- could have pursued this series forever. Other flowers lend themselves to similar symbolical and moral teachings and it would be easy to enumerate the long list of possible subjects of study. There is the blood-red poppy, the speedwell, the iris with its sword-leaves, the large family of orchids presenting the mimicry of all shades and shapes, of all various meanings. The thistle and the cactus, the mistletoe and the palmtree, the lily and the primrose, the ferns and the daisy, the houseleek and the flax, the lindentree and the elder, the evergreen, the broom, the heather, the wolfsbane, the pansy, the nettle, the sensitive plant, and a hundred other plants deserve faithful consideration by a poetical and philosophical mind; furthermore the saprophytes and parasites, all these species showing some marvellous physiological phenomenon, all those interesting by their means of propagating, their selection of a particular dwelling-place, their travels across the world. The idea of publishing those wise prose poems is not yet abandoned. The first plan however, to complete them by adding a score of yet unwritten sketches, using where feasible the notes left by Elie Reclus, had to be abandoned, for no compiler could aim at approaching the style and the inexhaustible expressiveness of an author so personal and possessing such a mastery over his language. What me the flowers will bring." Sermons in stones and good in everything." "He who hunts after marvels proves thereby that he does not yet understand much of his own life. The savage believes in a doctrine on account of the miracle; the philosopher will only adopt the same doctrine in spite of the miracle. "In the most common things, the great Mystery of Life is hidden, the secret of the liquid gold, of the life-elixir, of the philosopher's stone. Instead of taking up the Hermetic books, look how the rivulet runs, behold the green tree. Newton discovered the great Law of Attraction by looking at a falling apple. Let us well look upon the apples that fall, instead of reading the reasonings of the spiritualists, the scholastics of our time, the physicians and apothecaries, the Purgans and Fleurans of Moliere, who believe they explain things by using words that are not understood and which will prove simple flummery by merely not intervening the terms." These are the impressions reccived most indelibly during visits to Elie Rcclus in his latter years, and they are recorded here with great pleasure. For those friendly relations with him must, of necessity, leave a deep impression in the mind. All one's life it will remain a joy to remember the man. How much more so for the writer who at all times has acces to the fertile brain of his late friend, while possessing the numerous documents and notes on plantlore!